This place. I have a strange fascination with it. It used to be a fancy downtown hotel called (I think) the In Town Inn. It’s been mostly vacant since I can remember, but there are a few hints of its former grandeur. Ha! Ha! Of course there’s no such thing. It’s just another empty building. Its most recent reincarnation was a residential treatment center for people with substance abuse issues; that didn’t last, but the name it went by – the Jim Kimmel Center* – is still there. But look at that wall of rooms. And lamps. Except for that one, lampless room. Anyway, I really REALLY want to get in there and take a few (thousand) pictures. But I want to do it without breaking in or anything. I’m sort of legal, when it comes right down to it. 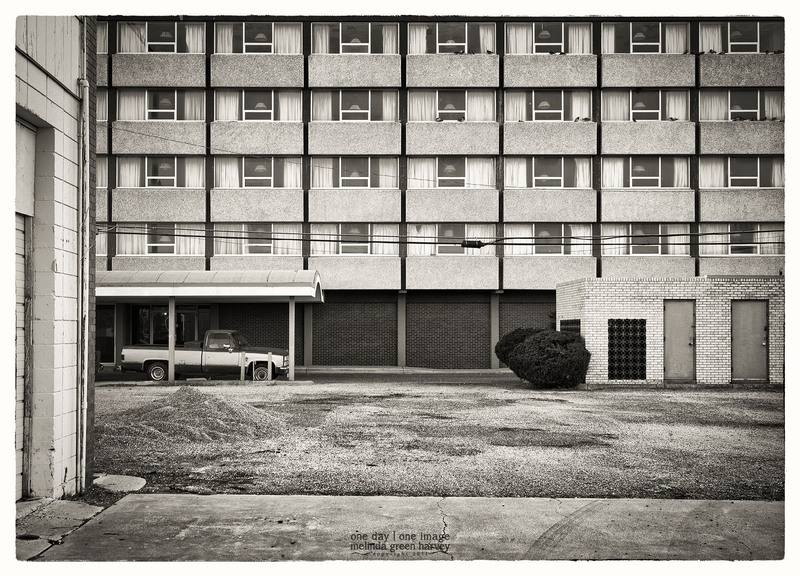 Posted on February 10, 2017, in Photography and tagged 365 photo project, abandoned buildings, architecture, black and white photography, Leica, lubbock, lubbock texas, melinda green harvey, monochrome, one day one image, photo a day, photography, postaday, texas. Bookmark the permalink. 13 Comments. I’m thinking of ways to track down the owner(s)! Thanks. You’ll know if it was a successful search, because I’ll be sure to post photos! Would like the Chevy truck. Rectangles and another good find. It was a very nice truck. There was also (for reasons I cannot begin to explain) an 80s era limo parked behind the truck. Better to wait for a more opportune moment. You can’t escape Texas justice! “Texas justice” sounds scary, even to me! I’m guessing there is a residential manager/inmate/patient haunting the place, wearing a lampshade on his/her head. If you go back and see two lamps in one window, or the one back in the empty window, you can be sure you are being watched. Seeing the lamp back in the empty window would be totally creepy. But now I am intrigued, and am thinking of making a drive downtown RIGHT NOW to check it out…!